Gartner Peer Insights is a robust enterprise IT product and service review platform that hosts more than 165,000 verified customer reviews across 320 defined markets. In markets where there is enough data, Gartner Peer Insights recognizes the vendors that are the most highly rated by their customers through the Customers’ Choice distinction. This peer-rated distinction can be a useful complement to expert opinion, as it focuses on direct peer experiences of implementing and operating a solution. To qualify for the Customers’ Choice distinction, vendors must have a product that is aligned to the market, have their overall rating (out of 5 stars) equal or higher than the mean rating for that market, and have equal or higher than median Product Adoption Review Coverage (PARC) in the same market as defined below. Only reviews submitted and published during the 12 month eligibility period (retrospective from sourcing deadline) are considered in the analysis for this distinction. Eligible Reviews must meet and/or exceed both the defined mean rating and PARC for the particular market defined at point of sourcing announcement. “Eligible reviews” must be submitted between April 1, 2018-March 31, 2019 AND are approved/published on the web site. Reviews from end-user companies <$50mm in revenue will be excluded from this methodology. For more information about our review approval process, click here. Reviews for legacy products (no longer being sold by the vendor) are not considered in the analysis for this distinction. Gartner Peer Insights was developed with the global enterprise customer in mind. As such, vendors that are named a Customers’ Choice demonstrate not only high ratings, but review coverage across industry verticals, company sizes and deployment regions. Reviews from end-user companies with revenue less than $50M will be excluded from this methodology. Industry of the reviewer is based on the reviewer profile industry. Reviewers can select from standard industry categories. Note that only top four industries of reviewers in this market will be considered for PARC. 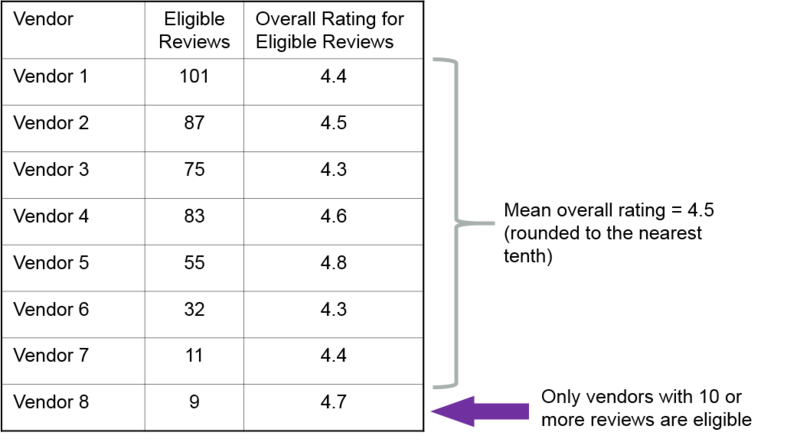 A vendor must obtain a PARC equal to or higher than the median PARC (rounded to the nearest tenth) across all eligible vendors in the market to qualify for the Customers’ Choice distinction. 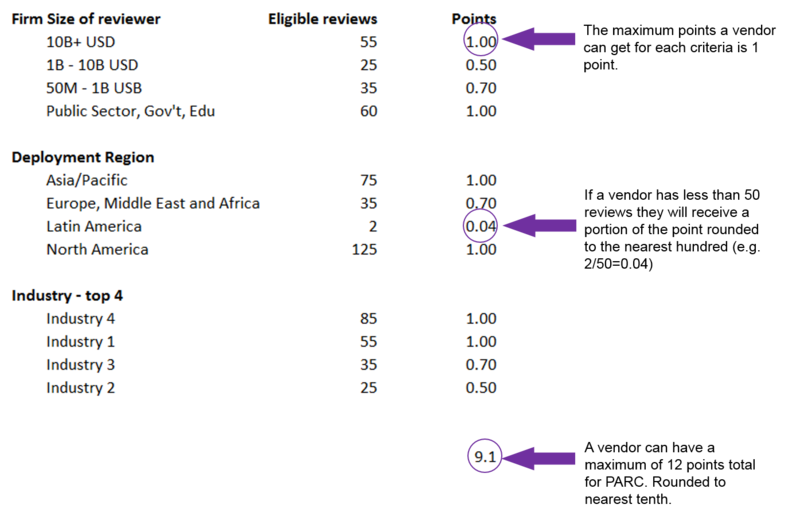 For each 50 reviews in the above listed categories a vendor will receive a maximum of 1 point toward PARC, for a maximum PARC score of 12. If a vendor has less than 50 reviews they will receive a portion of the point rounded to the nearest hundred. For example, 33 reviews equals 35/50=0.66, or 2 reviews equal 2/50=0.04. Reviews of all vendors that have 10 or more eligible reviews for the specified 12 month period will be included in the assessment for identifying the median PARC for the market. Each vendor’s PARC will be rounded to nearest tenth. If a reviewer has selected multiple deployment regions the review will be counted as one review against each of the different deployment regions selected. A vendor must meet or exceed mean overall rating in the market (rounded to the nearest tenth) to qualify for the Customers’ Choice distinction. Mean rating is determined in each market for a specified 12 month period. Mean overall rating for a vendor will be calculated based on “Eligible reviews” that must be submitted between April 1, 2018-March 31, 2019 AND are approved/published on the web site. Reviews of all vendors that have 10 or more eligible reviews for the specified 12 month period will be included in the assessment for identifying the mean overall rating for the market. For more questions, please see our Customers’ Choice FAQ page or contact PeerInsights@gartner.com. For vendor guidelines on how to use the Gartner Peer Insights Customers’ Choice Logo and the quote policy, please click here. *All deadlines are as of 12:00AM Eastern Standard US time.